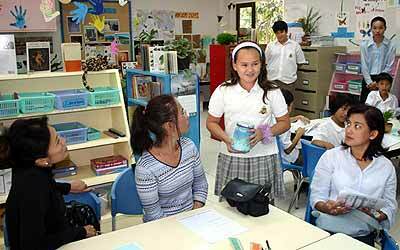 Parents of Elementary and Middle School students visited the American Pacific International School recently. They were welcomed by the Head, Keith Wecker and other members of the Senior Management Team before moving to their children’s classrooms to hear more about this year’s program. Tiffany explains and the parents listen. Each Grade had its own focus, with the class teacher explaining the curriculum and activities used to support learning. Later, the parents were joined by their children and shown the children’s work, including enjoyable activities. Students in Miss Lisa’s class explained their ‘Compliments Jar’ where they collect notes which say something nice about another member of the class or their teacher. At least one Middle School student challenged his mother to a game of table tennis! Keith Wecker has always enjoyed meeting parents and involving them in the development of schools. Two further meetings are scheduled this month: the first, for the parents of day students in Grades 1-12 at APIS, will be held at the Headmaster’s house on the APIS campus starting at 10 a.m. next Tuesday November 16, while the second will be held in Bangkok on Sunday, November 21, for parents of Bangkok-based boarders. The structural integrity of a bamboo hut can be attributed to not only the strength of Asia’s most functional wood, but also the teamwork and perseverance of its dedicated builders. Last week, Grade Nine students at the Prem Tinsulanonda International School joined forces with their age counterparts from Australia’s Kardinia International College for a week of nature, adventure, and Thai cultural immersion. 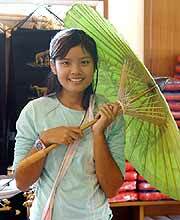 Som appreciates the beauty of her finely handcrafted green umbrella. Kardinia is one of the many schools from around the world that sends its students regularly to participate in Prem’s Visiting Schools Program (VSP). Schools that have recently been engaged in the Visiting Schools Program include the United World College of Southeast Asia at Singapore, Germany’s Gymnasium Starnberg, and the American School in Hong Kong. Prem students learn the painstaking craft of constructing an umbrella frame. The students took field trips every day with Prem teacher Lori, VSP teacher John, and Ajahn Phil, the Kardinia supervisor. One day they visited a Thai handicraft market. On another day the students went trekking near Chiang Dao, where they learned about different species of bamboo and elements of the ecosystem that affect its growth and survival. This particular group of Kardinia’s Grade Nine students will be at Prem until December, and last week’s program was one way to make their experience in Thailand a more well-rounded one. To enjoy the beautiful surroundings of Northern Thailand is one thing, but to form relationships with Thai and international students of their own age serves to make their time here that much more meaningful. Likewise, Prem’s own students benefit from their campus being not only a school, but also a center for international studies. Payap University continued with its 30th anniversary celebrations with a performance of Payap’s Symphony Orchestra on Saturday November 6, 2004. 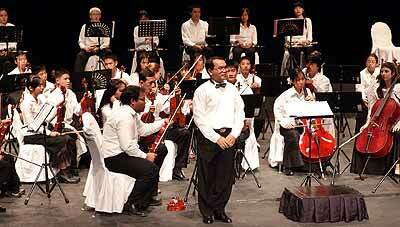 This 60 musicians Symphony Orchestra was again directed by Professor Sompong Wongdee. The two opening pieces were both from Mozart: his First Symphony in E minor (K.16) and his Concerto in C Major for Flute and Harp both in 3 movements. The spirited soloists for Mozart’s Concerto for Flute and Harp were Annette George (Flute) and Judith Utley (Harp). As this was an orchestra with (mostly) Thai musicians who graduated from Payap (or are in the process of graduating), they also played some well known Thai music including H.M. King Bhumibol’s “Love in Spring” (Lomnaow) and “Falling Rain” (Saifon), as well as Master Montree Tramoj’s “Malay Dance” (Laoduangdokmai) which were all warmly received by the full house. To close a successful evening, Payap’s Symphony Orchestra played Haydn’s Toy Symphony. It was quite obvious that every musician seemed most comfortable with this piece and they played their heart out. Congratulations for this great initiative go to Payap University and its enterprising Music Department. We hope that such quality evenings will have many more to follow and that Professor Sompong Wongdee will get the support he will need. 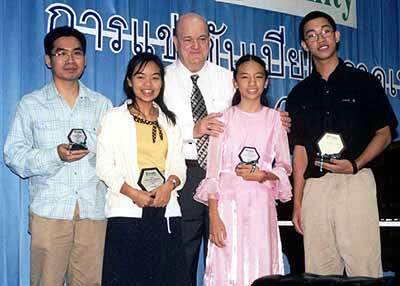 The next performance will be on February 16, 2005 at Payap University Chapel. After last month’s great success of the Chiang Mai Symphony Orchestra at Kad Theatre which attracted over 1300 paying spectators, it became quite clear to me that Chiang Mai’s music lovers are prepared to pay for quality music. Perhaps Payap should consider a modest seating charge next year? The TV “Kids Only” team arranged activities for over 200 Chiang Mai secondary and high school students on October 30 at Payap University, Chiang Mai. TV program production given by Karen Thomson, a senior director from USA. Ten enjoyable activities were introduced to the students including Voice Training, where Ajarn Tianchai Sooktiang, director and teacher at the Voice Studio Chiang Mai taught students how to sing and breathe while singing. Members of the Kids Only group. The second activity was acting lessons from Ajarn Budsaba “Kru Kob” Waesorhor from Kad Performing Arts Academy who taught them about acting, use of eye, voice, and emotion. The third activity was Creative Design where the students were taught about print media design by Kant Jaru-ankkura, graphic designer and manager of the Good On Ya Idea. Creative Writing was the fourth where Pattama Jongsuwanwattana and Sainam Nateekunnatham taught students techniques for producing good copywriting for advertising, radio script and slick slogans. 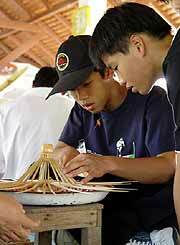 Other activities included Creative Thinking which had Somporn Moonsarn, producer of the “Kids Only” program teaching students to practice their thinking in creative and innovative ways. Another interesting activity was on being an MC. Karen Klongtruadrok and Lakkhana Saengsuwan gave them useful advice and techniques. Song Writing was covered by Weera Wattanachantrakul, song composer and the owner of the Little Voice Studio. The final activity was TV program production, where Ajarn Karen Thomson, a senior director from USA, gave advice on how to produce television programs. The Kids Only Program is produced by the CBN Siam Company broadcast on Channel 11 and receives good ratings from over 2.2 million fans. Ajarn Santi’s students from Santi’s Piano Studio excelled at the latest Trinity piano competition held in Payao. The competition was held during October covering four different age groups, and over 80 students from the northern region of Thailand were part of the piano competition from 10 to 19 years of age. Chiang Mai’s “Jirapat” and “Lukjan” made it to the finals and showed much dedication as well as expertise. “Un-un” (not in the photo) won 3rd prize in her age group. The Santi Studio students who were amongst the awarded musicians were “Gift” (2nd from right) who won the 2nd prize from 13 year age-group; “Mim” (2nd from left) won the 2nd prize from 19 year age-group and “Wan” (extreme right) who won the 1st prize from 19 year age group. Cross-cultural celebrations have always been important to the diverse community at the Prem Tinsulanonda International School. Last Friday, such a tradition became apparent as the Junior School celebrated Halloween in style. The festivities involving costumes, cake, candy, and fun lasted from morning until evening. Grade Four hosted the school-wide Halloween assembly. In the morning, the students marched into the auditorium in costumes ranging from witches to fairies. They sang and explained the history and customs of Halloween. During the middle of the day, Junior School students paraded around campus, showing off their costumes to the Senior School. Although the little ghouls, ghosts, and ninjas were excited to be out and about, nothing could compare to the fun which lay in store. Amidst all the excitement and organized chaos of the afternoon, several teachers were able to take a step back and reflect on the broader meaning of the celebration to them. Dutch-born Diana van Mersberger explained, “In Holland, we don’t have Halloween. I’m glad that we can experience it now.” Canadian teacher Cecile Poulan related her feelings on the day: “It’s nice for teachers who come from places where Halloween is celebrated to continue our traditions. This is a way of bringing a piece of home to Prem.” In the world of Prem, where many people are far away from their original cultures, that is what tradition is all about. A 48-hour filmmaking contest is open to high schools in Asia, to be shot over the weekend of November 19-21, with the annual Film Festival to screen the winners during April 11-16, 2005. You can still get a team organized and send an email to rfriedericks @ hkis.edu.hk to register! You will get an email at exactly 5 p.m., giving you the theme, prop, and line of dialog that MUST be in your movie to qualify! No pre-created video or music can be included - everything must be created during the 48 hours. Submissions for the Film Festival in April can include the 48 hour movies or others produced during the current school year in the following categories: 1) Animation, 2) Ads or Promotional, 3) Short Films (Drama or Comedy), 4) Music Videos, 5) Documentaries. The next High School Film Festival is scheduled for the week of March 28 - April 2, 2005. Submissions from International Schools in Hong Kong and the rest of Asia are welcome! Students completing videos in video production classes, as projects for other classes, clubs and service groups or independently may submit them to d*Net Flicks. Students from other schools are also welcome to submit productions! Please contact Richard Friedericks [email protected] for details.